Cervicogenic Headache and Spine Health? For some people headaches are a common almost every day occurrence…’just my normal headache’. But when you think about a headache it’s abnormal…anything but normal and may be related to poor spine health. Headache prevents us from functioning at our normal levels of performance and if severe enough, can even make us sick with vomiting. Many people have found that headaches are very successfully treated with Chiropractic care. The most common type of headache that Chiropractors see in their patients is the Cervicogenic Headache. Which simply means, a headache, with its origin in the cervical spine (neck) with a detrimental effect on spine health. Headaches are a serious condition, frequently having severe impact on an individual’s function, causing pain, visual problems, light sensitivity, nausea and vomiting and inability to carry on normal daily activities. The pain an individual experiences during a headache is not strictly caused by the brain. The brain as an organ does not feel pain……remember the brain surgery where the patient is awake and is asked to perform certain activities. So what causes the pain? The covering of the head or scalp is pain sensitive, as are the membranous coverings of the brain, together with the blood vessels and nerves that travel through brain tissue. When any of these soft structures become irritated there is the potential for headache to erupt. Since cervicogenic headaches originate in the neck (cervical spine) the most common theory of onset is that alteration of the alignment of the vertebra (bones of the neck) cause abnormal movement patterns and the resultant postures cause pressure on nerves that originate in the neck and that irritation culminate in headache. What causes the alteration in vertebral alignment? The most common cause is trauma, car accidents and other traumas that impact the neck. The more sinister cause is, texting neck or computer neck that comes about with extended periods of head and neck flexion. Texting, operating iPad or tablets and prolonged computer use can cause neck soft tissue and muscles to become fatigued, which in turn can impacts on the normal weight bearing curve in the neck, whereby the neck loses it ability to support the weight of the head. The headaches may vary in location from the scalp, to the forehead, behind the eyes or the temples and even around the ears. The nerves from the neck go to muscles, tendons, and other soft tissue structures in the head and face so the final location of the headache can varied. Chiropractic has demonstrated good results with treatment of this type of headache because chiropractic focuses on detecting the cause and then correction of the problem. How will you find the cause? Chiropractors at Simply Chiropractic are very experienced at detecting the underlying causes of spinal dysfunction. Initially we conduct a thorough case history, followed by an extensive physical examination of your spinal function with special attention to your neck. The pain associated with headaches can be variable in location, intensity, duration, type, onset and aggravating activities. 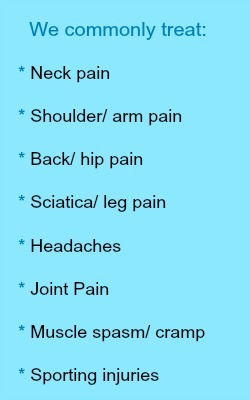 All these factors are important in the diagnostic process of your spine health. The physical assessment will examine your head and neck movement, together with a neurological examination looking at the functional level of your nervous system and your general spine health. The physical examination may include assessment of your global posture, together with assessment of muscle tension and balance, measurement of individual joints and overall neck flexibility and muscle testing. Followed by a postural examination that grids and measures your posture relative to gravity, next we will utilize the latest Digital Postural Scanning technology to provide a blue print of your posture. This allows the Chiropractors in our York Clinic to build an accurate picture of just how your head and neck are functioning and the potential impact on the cause of your headache symptoms. Consideration will also be given to whether X-rays or other imaging is indicated. Together these procedure may take 45 minutes to an hour to complete. At the outset your Chiropractor will explain to you exactly what examinations are appropriate and necessary and will obtain your consent before initiating the above procedures. Once the findings have been correlated and your Chiropractor has ruled out any contraindications to treatment, they will discuss the diagnosis with you and make recommendations for a care plan tailored to your particular circumstances. What does a Chiropractor do to relieve the symptoms and correct the spinal dysfunction associated with cervicogenic headache? There are many chiropractic techniques available for the treatment of this problem and selection of the technique appropriate to each case is determined on a case by case basis. The Chiropractor will want to determine whether the proper curve is present in the neck? Are the exit openings for each pair of spinal nerves clear? Is the head in a neutral position and are the shoulders level? This together with other considerations are the basis upon which the Chiropractor creates a plan of specific chiropractic adjustments, exercise, and rehabilitation that will help you recover your optimum spine health. The Chiropractor will also take into account the presence of spinal degeneration (arthritis or spondylosis) when formulating a treatment plan for you, there are low force chiropractic techniques that can be utilized that painlessly move vertebrae to improve the functioning of the neck thus relieving pressure on those nerves causing headache. The exercise and rehabilitation programs the chiropractor will prescribe are essential in the long term improvement and recovery from cervicogenic headache. These may include some traction procedures to perform at home regularly, much in the same way as someone would take a medication on a regular basis for a chronic ailment. Call Simply Chiropractic on 01904 466 606 now! For some people headaches are a common almost every day occurrence…’just my normal headache’. But when you think about a headache it’s abnormal…anything but normal. Headache prevents us from functioning at our normal levels of performance and if severe enough, can even make us sick with vomiting. Many people have found that headaches are very successfully treated with Chiropractic care. The most common type of headache that Chiropractors see in their patients is the Cervicogenic Headache. Which simply means, a headache, with its origin in the cervical spine (neck) with a detrimental effect on spine health. Headaches are a serious condition, frequently having severe impact on an individual’s function, causing pain, visual problems, light sensitivity, nausea and vomiting and inability to carry on normal daily activities. The pain an individual experiences during a headache is not strictly caused by the brain. The brain as an organ does not feel pain……remember the brain surgery where the patient is awake and is asked to perform certain activities. So what causes the pain? The covering of the head or scalp is pain sensitive, as are the membranous coverings of the brain, together with the blood vessels and nerves that travel through brain tissue. When any of these soft structures become irritated there is the potential for headache to erupt. Since cervicogenic headaches originate in the neck (cervical spine) the most common theory of onset is that alteration of the alignment of the vertebra (bones of the neck) cause abnormal movement patterns and the resultant postures cause pressure on nerves that originate in the neck and that irritation culminate in headache. What causes the alteration in vertebral alignment? The most common cause is trauma, car accidents and other traumas that impact the neck. The more sinister cause is, texting neck or computer neck that comes about with extended periods of head and neck flexion. Texting, operating iPad or tablets and prolonged computer use can cause neck soft tissue and muscles to become fatigued, which in turn can impacts on the normal weight bearing curve in the neck, whereby the neck loses it ability to support the weight of the head. The headaches may vary in location from the scalp, to the forehead, behind the eyes or the temples and even around the ears. The nerves from the neck go to muscles, tendons, and other soft tissue structures in the head and face so the final location of the headache can varied. Chiropractic has demonstrated good results with treatment of this type of headache because chiropractic focuses on detecting the cause and then correction of the problem. What does a Chiropractor do to relieve the symptoms and correct the spinal dysfunction associated with cervicogenic headache? There are many chiropractic techniques available for the treatment of this problem and selection of the technique appropriate to each case is determined on a case by case basis. The Chiropractor will want to determine whether the proper curve is present in the neck? Are the exit openings for each pair of spinal nerves clear? Is the head in a neutral position and are the shoulders level? This together with other considerations are the basis upon which the Chiropractor creates a plan of specific chiropractic adjustments, exercise, and rehabilitation that will help you recover your optimum spine health. The Chiropractor will also take into account the presence of spinal degeneration (arthritis or spondylosis) when formulating a treatment plan for you, there are low force chiropractic techniques that can be utilized that painlessly move vertebrae to improve the functioning of the neck thus relieving pressure on those nerves causing headache. The exercise and rehabilitation programs the chiropractor will prescribe are essential in the long term improvement and recovery from cervicogenic headache. These may include some traction procedures to perform at home regularly, much in the same way as someone would take a medication on a regular basis for a chronic ailment.